In the long-term of progress of Chinese civilization, millions of valuable artworks were created by intelligent Chinese people. However, because of the wartime robbery or iniquitous trade, numerous national treasures have been lost overseas. Most of them are distributed in museums in the UK, France, Germany, US and Japan. 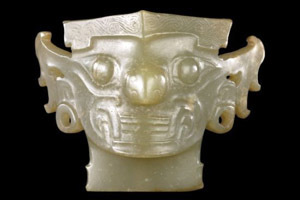 British museums and libraries have collected 1.3 million Chinese relics from different dynasties. In the British Museum, there are more than 30,000 pieces, including Chinese paintings and calligraphy, ancient books, jade, porcelain and bronze ware, which cover nearly 7000 years of Chinese history. France is the second largest country to have the most Chinese relics after UK in Europe. In the Louvre Museum, there are over 30,000 relics and among them there are about 6,000 pieces of ancient pottery, bronze ware from the Shang and Zhou dynasties and porcelain ware. Japan is said to have the most relics from China. Since 1840, at the time of the First Opium War, China has lost many of its treasures. It is said that more than 1,000 public or private museums in Japan have Chinese treasures. America is home to most of the lost Chinese paintings and calligraphy. In the Freer Gallery alone, there are over 1,200 paintings and over 500 pieces in the Metropolitan Museum of Art. 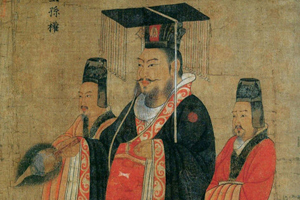 Han Shan and Shi De are two legendary figures of the Tang Dynasty (618-907), who are said to have lived in Guoqing Temple and trained with the Zen master Fenggan. 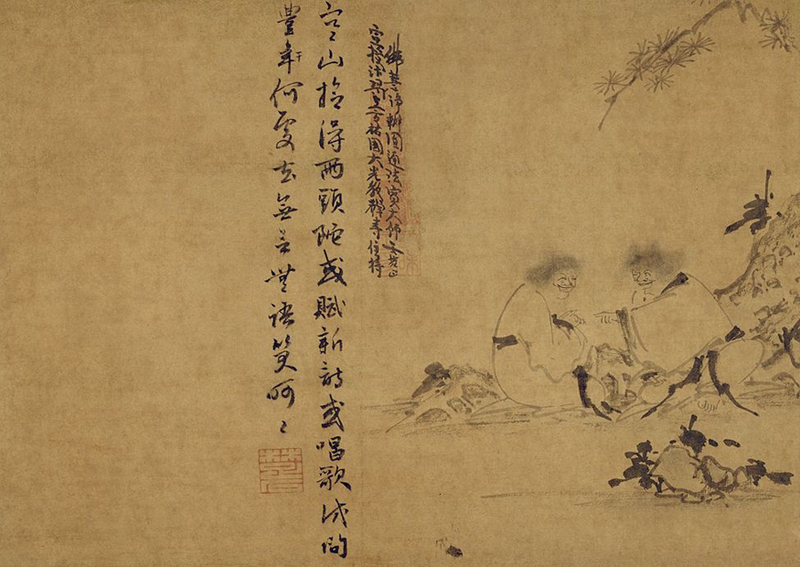 Han Shan and Shi De paintings were favored by Zen monks. 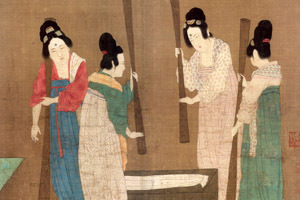 This scroll painted by Yintuoluo, a monk in the late of Yuan Dynasty, was highly prized by Japan. It depicts that Han and Shi roared with laughter without answering any of the questions put to them by Fenggan. The box that accompanies this work carries an inscription by the well known tea master and governor of Matsue, Matsudaira Fumai (1751-1818), and from it we know that this famous work was formerly in the possession of the Asano family. And now it is housed in Tokyo National Museum.